The last Middlesex Centre Council meeting for the 2014-2018 Council was fairly straightforward! A little discussion here and there, but nothing major to report. Let’s get down to recapping what happened on Wednesday. Two items were added on Wednesday to the agenda. 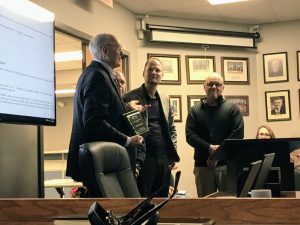 Mayor Al Edmondson presents Sifton with Green Builder recognition plaque. Kevin Moniz presented the Martin Road Development Drain report. It was a fairly short presentation, and a few clarifying questions were asked. Ultimately it was received and the next step will occur soon. We presented Sifton with their Green Builder recognition. All items were received for information. I’m looking forward to more plain language planning application notices being circulated. If you have any feedback on the sample notice, or a real notice that you receive, please let us know! The more staff can improve the understanding of a notice from the time you read it, the better! Middlesex Centre Council approved extending our service agreement with Lucan-Biddulph for another three years. Now it goes to Lucan-Biddulph Council for approval. Staff estimate revenue of $60,000 per year based on recent experience and what they know of upcoming activity there. Arnie Marsman reported that Lucan-Biddulph’s needs do not impact our staff’s workload enough that we need to re-think this arrangement. Council approved the official plan amendment, which institutes a holding zone pending Middlesex County approval and a few more upcoming steps in the process, such as a site plan. Hopefully concerns raised by the neighbouring property can be effectively accommodated to everyone’s satisfaction during the site plan approval phase. One of the roof top units at the Komoka Wellness Centre has failed, and it’s responsible for circulating fans through the dressing rooms. We’ve been told that Carrier doesn’t design them so large any more because of issues like this, where they fail earlier than typically expected. If we had built the Wellness Centre today, we would likely end up with four, smaller rooftop units instead of two. The work was approved. Both applications were approved. It was nice to see that both applicants were well informed, and had a thorough understanding of the conditions they were agreeing to. We held a short, closed meeting around 6:30pm. We also took a short break from 6:40pm until 7pm before we could start public meetings. That’s all there is to report at this time! Have a great weekend. You can anticipate a preview of next Wednesday’s inaugural 2018-2022 Council meeting this weekend!